Again we need a cultural translation here: trolley = streetcar = tram. 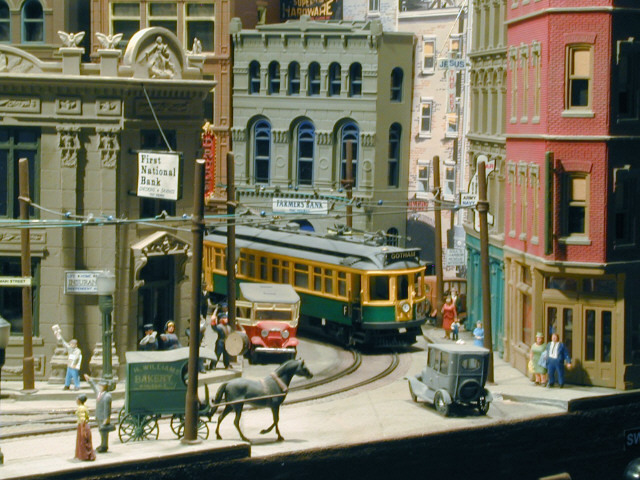 Streetcars tended to be smaller that the big interurbans running between towns. But you could find an interurban winding its way through the city traffic on its way to the city terminal. 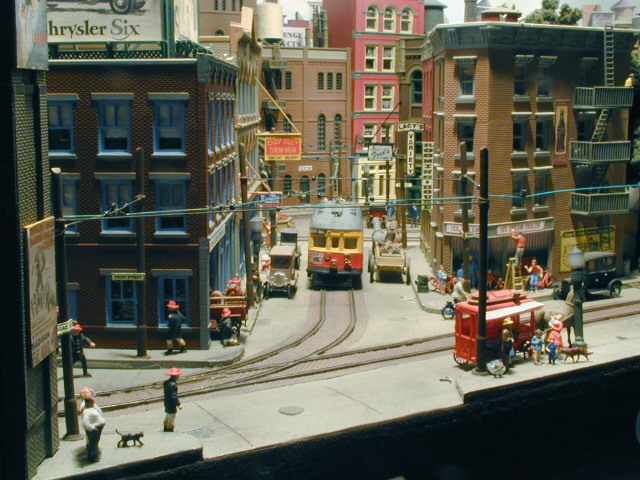 What is missing from a trolley layout is extensive freight operations. Freight cars might be seen on inner city tracks, but this was not common. What you might see is a freight motor (in the UK think the Southern Region Motor Luggage Van) moving small quantities of freight around. But the passenger service is intense, although it will consist of a single coach, or perhaps two. (Having said all this, there will be exceptions to the rule somewhere – please don’t tell me I’m completely wrong). So a trolley layout has real potential for a tight space. Short trains, very sharp curves, lots of urban scenery to model. There is a lot going for such a layout, if you can face the idea of a layout with little freight and few of the conventional railway buildings. To illustrate the potential, here are two links to excellent layouts. 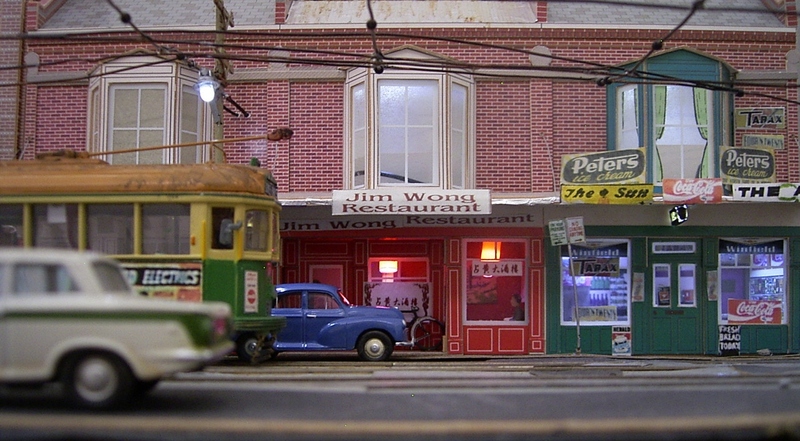 The first is Fred Miller’s HO scale trolley model site (http://www.fnbcreations.net/tractionfan/). Here are a couple of photos from the site, showing the high detail and concentrated modelling. If you wonder about the curves, they are 6 ¼” radius representing a prototype 45 ft radius – in HO scale. Even TOMIX Japanese tram track has a smallest radius of 4″! I was somewhat annoyed to find that the entire layout now lives in Charlotte’s Trolley museum. We tried to visit the museum when visiting Charlotte – but it was closed. And that was before I discovered the layout was there. 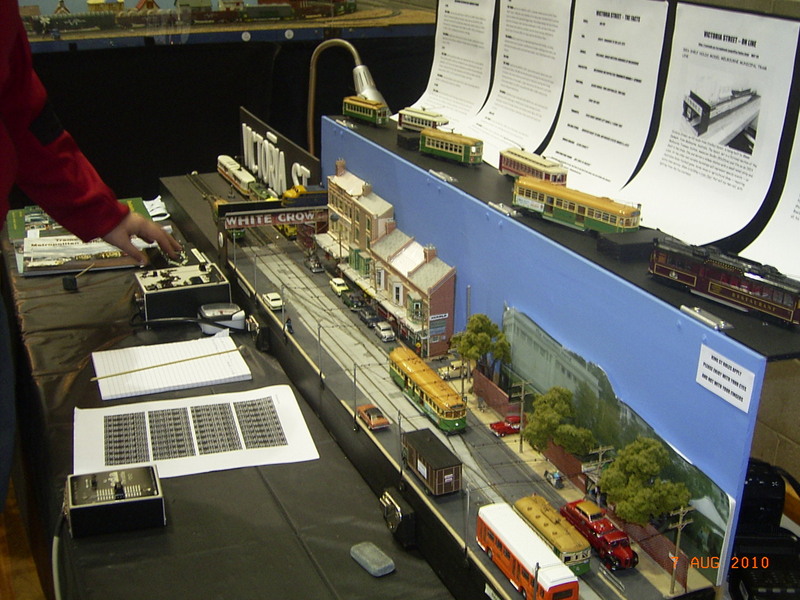 “A small model tramway layout loosely based on the Melbourne Metropolitan Tramway Board (MMTB). Originally set up as a test track, like all layouts evolved into some thing more, with a slight west suburban slant towards its location. Again note the size of the modules – again remember these are HO scale. Below are photos from the site, showing the compact size. And finally, this photo does suggest that this blogger has visited the layout – unfortunately not, must be some relation. This entry was posted in Inspiration, Jon's layout ramblings, Layout design, Traction and tagged interurban, layout design, model railroad, traction. Bookmark the permalink. G’day, and thanks for the link to my BlogSpot, if you have any questions feel free to ask. Great work. A real inspiration. I’ve been thinking and planning my own trolley layout (mostley thinking) and you have really given me a lot to consider. What scale is the parokeet? 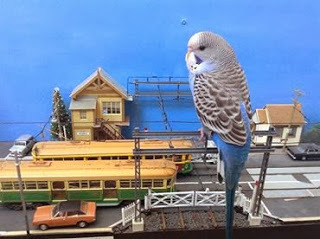 It’s a 1 to 1 scale Budgie! If it’s anything like ours, it’s fitted with a very loud digital sound decoder.